As the clock ticks remorselessly towards Zero Hour and the return of Dracula, the devastated remnants of Department 19 try to hold back the rising darkness. Jamie Carpenter is training new recruits, trying to prepare them for a fight that appears increasingly futile. Kate Randall is pouring her grief into trying to plug the Department’s final leaks, as Matt Browning races against time to find a cure for vampirism. And on the other side of the world, Larissa Kinley has found a place she feels at home, yet where she makes a startling discovery. Uneasy truces are struck, new dangers emerge on all sides, and relationships are pushed to breaking point. And in the midst of it all, Department 19 faces a new and potentially deadly threat, born out of one of the darkest moments of its own long and bloody history. Zero Hour is coming. And the Battle Lines have been drawn. All eyes are on Perdido Beach. The barrier wall is now as clear as glass and life in the FAYZ is visible for the entire outside world to see. Life inside the dome remains a constant battle and the Darkness, away from watchful eyes, grows and grows . The society that Sam and Astrid have struggled so hard to build is about to be shattered for good. It’s the end of the FAYZ. But who will survive to see the light of day? When you are afraid to fall asleep, when all your dreams are nightmares, write us a letter, put it under your pillow, we will rescue you… It is almost time for the old and tired Sleepwalkers to return to the waking world. But before they go, they must conjure and train three new replacements. For who else will look after the Sleepwalking House and be there to answer the call of a child frozen stiff with fear, trapped in a nightmare? This is the story of the NEW Sleepwalkers… Filled with action and adventure, and all things that go bump in the night, three brave new heroes tackle the weird and the wild in this uplifting and reassuring story about pulling together as a team and having the confidence to stand up to your fears. “It s as if the wooden chest is luring me, urging me to open it – daring me almost. Open me up. Look inside. Come on, just for a second; it won t hurt.” Celina O Malley was sixteen years old when she disappeared. Now, almost forty years later, Bayley is sleeping in Celina s room, wearing her clothes, hearing her voice. What does Celina want? And who will suffer because of it? A ghost story. A love story. A story of revenge. Risha is strong and outspoken, and at 16 has developed into a leader of men, a strategic thinker, and a woman — one can imagine — who will assume the legacy left by her mother. The story begins with 13-year-old Risha living a simple life in the mountains with her father. When her father suddenly dies, Risha is left alone, an outcast of her village. Disguised as a boy, Risha leaves the village with a group of traders, on a quest to find out the truth about her mother and her heritage. Here begins a grand sweeping adventure as Risha is caught up in dangerous pursuits, intrigue, trickery and betrayal. She is left for dead, confused by the actions of many, and is made to hide from those who wish her harm. She finds out by chance that she is Cattra’s daughter. Who is Cattra — and why do so many wish Risha harm? Camille wants to find the perfect boy, with an athlete’s body and a poet’s brain. But when she’s rejected at her new college party, she knows there isn’t a boy alive who’ll ever measure up. Enter Zoe, her brilliant but strange best friend, who takes biology homework to a whole new level. She can create Camille’s dream boy, but can she make him love her? Dead Romantic is a new take on Mary Shelley’s Frankenstein. 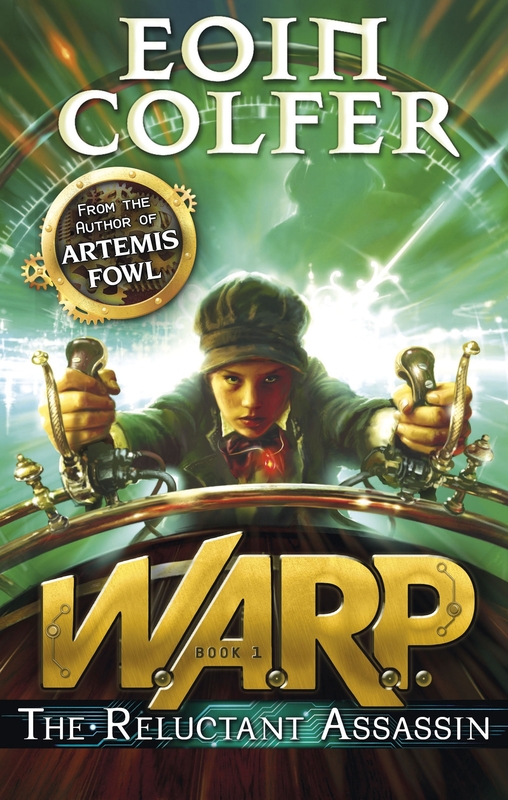 The reluctant assassin is Riley, a Victorian boy who is suddenly plucked from his own time and whisked into the twenty-first century, accused of murder and on the run. Riley has been pulled into the FBI’s covert W.A.R.P. operation (Witness Anonymous Relocation Program). He and young FBI Agent Chevie Savano are forced to flee terrifying assassin-for-hire Albert Garrick, who pursues Riley through time and will not stop until he has hunted him down. Barely staying one step ahead, Riley and Chevie must stay alive and stop Garrick returning to his own time with knowledge and power that could change the world forever.